Duluth, GA is one of Atlanta's suburbs that is home to several private "parking management" companies who troll business parking lots at night in search of parked vehicles. As soon as they encounter one, they apply a boot to immobilize it. If the car is abandoned, they'll call a tow truck to have it hauled away. 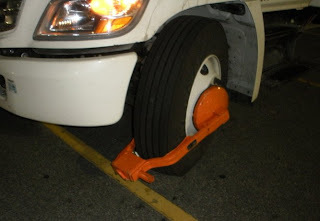 If the owner returns before the tow arrives, or if the vehicle is occupied, as in the case of an RV or truck, they will demand a cash fee to remove the boot. If the owner refuses to do so, or can't come up with the fee in cash, the vehicle is towed and the owner then has to pay both the boot and the towing fees. Without state laws or local ordinances to rein them in, these businesses are free to operate without a criminal background check, charge whatever fee they choose, use whatever tow service they prefer (likely a sister business), and generally conduct business however they'd like. Helga was booted two weeks ago in the parking lot of a Walmart Supercenter in Duluth. The thug who booted us at 3:30 am on a Sunday morning demanded $500 in cash to remove the boot. When Hoss told him we don't carry large amounts of cash, he suggested we call our trucking company for a Comcheck - a money transfer system used primarily by trucking companies to advance funds to their drivers for fuel and repairs, etc. If we didn't do so, he would have it towed and we would have to pay a $650 towing fee in addition to the $500 boot removal fee. All together now, SNL fans: "Welll, how conveeeenient!" Athough thoroughly steamed about the situation, we wrangled a Comcheck from our owner and Hoss was driven 50 miles roundtrip to a truck stop to have it cashed. The thug removed the boot, gave us a receipt, and went on his merry way. With more sleep no longer an option, we drove until we found a cup of coffee, then reviewed the receipt, only to find the owner - who apparently sits at home and dispatches and manages his thug employees from there - had chosen to categorize us as a semi, which, of course, incurs the maximum fine. Even an idiot can see that Helga isn't a semi. Hoss called the owner to point out that despite the fact that Helga clearly has two axles and six wheels, Boss Thug had skipped over the "2 axle 6 wheel" truck category and went straight for "semi". Hoss politely requested a refund. Guess how that went. So, while we were home for a few days over the weekend, I printed off a letter or two, complete with several attachments, including photos. And mailed them to everyone from Boss Thug to the Georgia Attorney General, local Magistrates to Walmart's corporate headquarters. We shall see who gets booted in the end. Muahahahaha.